A play that is an interpretation of another play faces several challenges. What if the audience is not familiar with the original play? How can the production pick up on very contemporary issues from a play originally written in 1972…46 years ago? 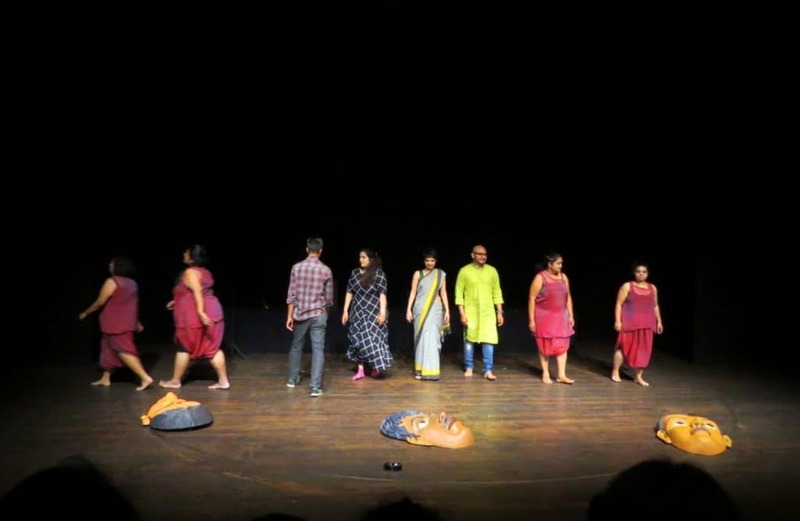 The Big Fat Company addressed these issues, and more, successfully, in their production, “Head 2 Head”, where the cast and crew “play” with Hayavadana. As I entered the theatre space, I found the first attempt in this direction by the Big Fat Company. 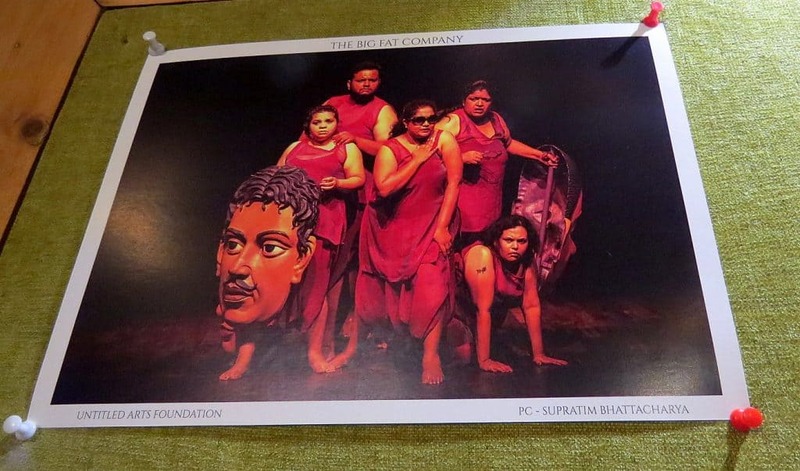 An excellent brochure, printed in Kannada and English, sought to make the theatregoers familiar with the context of Hayavadana, and the issues of identity and gender, which are as relevant today as they were when the play was written. Today, a person’s weight, and it loss or gain, has become a multibillion dollar industry. Fat (or a large size) is seen as a health hazard, and there is constant pressure on those who are large-sized, to reduce their weight and body size. The Big Fat Company made a statement with its cast of “large” people, and chose a kind of identity that is often reviled: that of the “plus size” people, who are built on more generous lines than their fellow human beings. Also, the play attempts to ask the same question that Girish Karnad asked all those years ago: is our identity decided by our body, or mind? If two men’s heads and bodies are transposed, will the resultant personalities make the issues clearer? “Hayavadana” is about two close friends, Devadatta (a man of intellect) and Kapila (a more physical man). Padmini marries Devadatta…but is attracted to Kapila. When, as a result of tension between them, they behead themselves, Padmini transposes their head…the resultant ambiguity raises the issues of the relationship of identity to body and mind. As the play opened, the first thing that struck the audience was the unusual costumes, in an iridiscent yet translucent red-green fabric, that the cast were wearing, whichever gender they were. It takes a lot of thinking to come up with a “unisex” costume like this, which will not restrict the actors’ bodies, and add visual appeal to the performance. The stage properties were minimal. Large masks denoting the three main characters were used, sometimes held right in front of faces, sometimes as a stage prop against which the cast leaned. The different personalities…the oily, smarmy director of the play, the egoistic leading lady to whom he kowtows,the catwalking models, the actor who is critical of what this play will achieve…they were all brought alive by the actors. And if proof were needed that being “large size” is not an impediment to being lithe, the actors proved how nimbly they could leap and dance, and how fast, too. One passage, with beautiful xylophone music, was particularly gymnastic and riveting to watch. 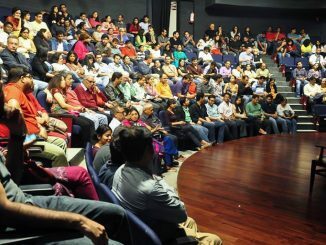 At other times, especially when the action was suddenly halted while the cast ate pieces of Black Forest pastry with great gusto…the audience laughed at the sure touches of humour (expressed also in the struggle between the urge to eat, and the torture of rigorous exercise to lose weight)….and wished they could be on stage, eating the yummy cake! The stage design, too, did not need much; this play can be performed in the simplest of theatre spaces. This left ample room for the well-choreographed movements of the actors. Even when very little space was needed, as in the closing scene, where each actor jostles through the rest to come and say some words, the economy of the stage design helped. The lighting of the performance must have a special mention. Highlights, low lighting, spot lighting …I do not know all the technical terms,but the lighting design enhanced the punch of the performance immensely. It must have taken quite a lot of interaction between the cast, director and the lighting designer to achieve this cumulative effect in the production. 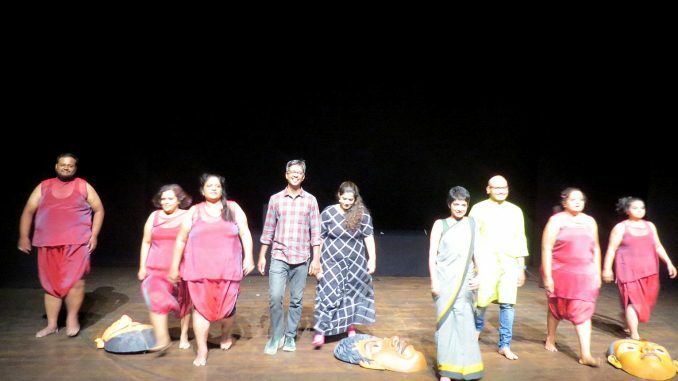 The good acoustics of Ranga Shankara certainly helped the cast in their dialogue delivery, and the music, never intrusive, formed an organic part of the play. Both the singing and the instrumental music were melodious and heightened the effect of the performance. Perhaps direction, as an art, consists of shaping and moulding the production through the rehearsals, and then stepping back, with just a light touch here and there, during the actual performance. The direction was very sure and deft, and at no point did it intrude upon the performance. Several self-referential lines talked of the actors’ body sizes,and how this affects both the actors and the play itself. A play talking about itself, while being based on another play…it was, indeed, an Escher-esque fugue that we watched. Since the Big Fat Company is a group of people specially selected for this self-referential play, it remains to be seen how the Untitled Arts Foundation, as a whole, progresses in its journey of the theatre. It would also have been good if the cast and crew had at least introduced themselves; personally, I would have liked a ten-minute discussion afterwards. When one has spent some time watching a play, one would like to know more about how it came to be performed, what the evolution has been, and what is planned for the future. As far as this play is concerned, however, I look forward to watching it again in the future, to see how the production has developed and evolved. A play that I would strongly recommend to theatregoers who like their social issues expressed with deft touches of stagecraft and humour. Friday, 6th April, 2018, 7.30pm; Saturday, 7th April 2018, 3.30 and 7.30pm. A series on celebrating World Theatre Day on 27th March.